In 1997, MCPL formed the Middle Country Library Foundation, a 501 (c)(3) corporation whose purpose is to raise funds and provide the governance structure for the Library’s initiatives that extend beyond the local community. The Foundation assists the Library in managing its growing number of regional and national initiatives and maintaining its leadership role in the broader community. The Foundation supports the Library’s ability to introduce exemplary programs and services to other libraries and populations, and to provide the mentoring and training necessary to ensure widespread implementation. 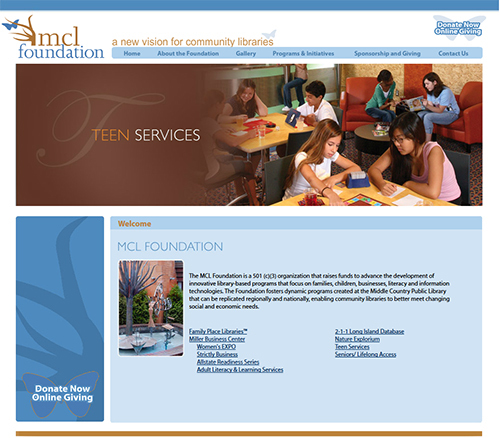 Since its inception, the Foundation has raised funds and directed restricted funds (approximately $250,000 per year) from a variety of sources to support the Library’s model programs and regional and national initiatives including Family Place Libraries, 2-1-1 Long Island Database, and the Miller Business Resource Center. In 2002, the Foundation received a special gift of $1 million to establish the Hagedorn Endowment for Family Place Libraries. The Foundation is comprised of a volunteer board and supported by library staff that assist the foundation with its administrative functions, including grant writing, fund-raising, and special project management.